Sharply dressed in a dark suit, a bright white T-shirt, stylish sneakers, and a health-code mandated hairnet, Jean-Georges Vongerichten watches as a fish cutter breaks down an entire Atlantic swordfish with a few flicks of his razor-sharp, machete-like knife. It’s 7 a.m. and the world-famous, French-born restaurateur has slipped through the streets of Boston for two days relatively unnoticed. Though he resides in New York, Vongerichten owns dozens of establishments from Bora Bora to Qatar and is set to open his latest, called Market, in Boston’s new W hotel next month. The soon to be finished W is part of Starwood Hotels and Resorts and is located on Stuart Street in the Theatre District. Though Vongerichten may not be as recognizable as celebrity chefs whose photographs grace their own lines of soup or cookware, he has managed to accumulate more stars than most constellations. His latest venture marks a return to Boston for the first time in 24 years. In 1985 he opened the Lafayette restaurant, his first in this country, in the former Suisse Hotel near Chinatown. With him on his Boston trip are Daniel Del Vecchio and Gregory Brainin, both of whom have collaborated with Vongerichten on scores of openings. Though all Vongerichten establishments incorporate the cuisine of the region to some extent, Market relies entirely on the bounty of area farms and fishermen. The Boston location will be the fourth such restaurant in the world, following Paris, Vancouver, and Atlanta. Vongerichten considers Market to be a “best of’’ drawing on techniques and recipes from his many other establishments. “One hundred percent of the menu will be local ingredients,’’ says Vongerichten, whose New York lineup includes Jean Georges, Mercer Kitchen, Spice Market, Vong, and JoJo. “I don’t know if they have foie gras in Massachusetts, so maybe that will have to come from upstate New York,’’ he adds, flashing an ever-present and slightly mischievous smile. 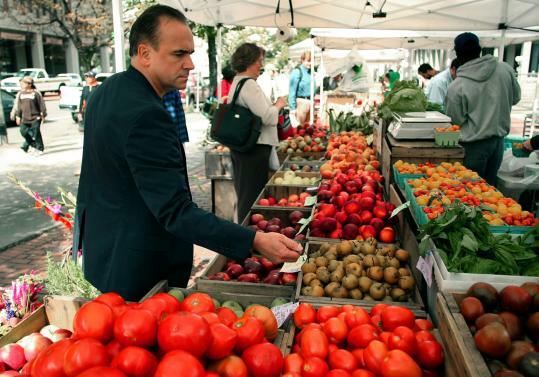 Much of his visit is spent assessing Boston’s cornucopia of locally sourced fruits, meats, vegetables, and fish. At the Government Center farmers’ market, he fondles tomatoes and sniffs peaches. “He’s a good cutter,’’ he says at the Globe Fish Co. after the knife-wielding employee has transformed the whole swordfish into steaks. At the farmers’ market a day earlier, Vongerichten and his collaborators are energized by the early fall produce. Each ingredient seems to suggest a potential dish on the new menu, and tantalizing offerings spring to mind as the men stroll the booths: “Venison stew?’’ “Apple-tomato salad?’’ “Green apple cobbler, super tart?’’ That night, the three chefs dine on scallops and chorizo at Craigie on Main in Cambridge. The W hotel is also sourcing materials locally. All of the stone adorning the lobby, which in W-speak is known as the “living room,’’ is quarried from either Amherst or Chelmsford. The main staircase is crafted from a single piece of granite, and the original whorls are clearly discernible when viewed from the landing above. While remaining regional in taste and flavor, Market’s menu will draw upon international techniques. Vongerichten, who trained extensively throughout Asia, is known for his elaborate preparations and exotic spicing (“Once you start eating ginger and chilies, you don’t go back,’’ he says), though he prefers to let the ingredients do most of the work. Market’s menu will include five meat and five fish entrees, plus appetizers and bar snacks, numbering between 22 and 25 dishes total. Combined, the dining room, bar, and living room bar seat nearly 200. Walking through an unfinished room at the W, Vongerichten eyes a mountain of unopened boxes, saunters over to them, and peers under the flap of the top most package. He slips his hand inside and withdraws a single brand new water glass, which he holds as tenderly as a farmers’ market peach, testing its weight and perhaps imagining the role this simple vessel will play in the new restaurant. “It’s good,’’ he says, peering into his crystal.